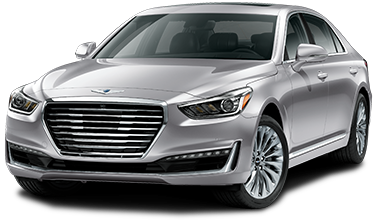 Closed end lease for 2017 G90 4dr Sdn 3.3T RWD (Model #E1422R65) available from December 1, 2016 through January 3, 2017, to well-qualified lessees approved by Genesis Finance. Not all lessees will qualify. Higher lease rates apply for lessees with lower credit ratings. Offer shown based on $2,499 due at lease signing (includes $689 first payment and $3,310 capitalized cost reduction). No security deposit required. MSRP $69,050 (includes destination, excludes tax, license, title, registration, documentation fees, options, insurance and the like). Actual net capitalized cost $57,096.31. Net capitalized cost includes $750 acquisition fee and includes credit for either $1,500 Valued Owner Coupon or $1,500 Competitive Owner Coupon. Dealer contribution may vary and could affect actual lease payment. Total monthly payments $24,804.00. Option to purchase at lease end $32,453.50. Lessee is responsible for third-party fees. Third-party fees vary by state or locality. Lessee is also responsible for insurance, maintenance, repairs, $.20 per mile over 10,000 miles/year, excess wear, and a $400 disposition fee. Disposition fee of $400 applies in all states except CO, IN, IA, KS, ME, OK, SC, WI, WV, & WY, where disposition fee is subject to state law limitations.